The recommendations were announced on 12 February 2018. According to an article on Devex, the move is in response to countries’ request for guidance on how to scale up preventative measures for people who may not currently show symptoms of illness, but are susceptible to incurring and developing active TB infection. Expanding the number of groups being prioritized for latent TB infection testing and treatment. The new guidelines identify some new high-risk groups: HIV-negative children aged five years are under; adolescents and adults who are contacts of TB patients; and contacts of patients with multi-drug-resistant TB (MDR-TB). Expanding the testing options. The WHO recommends scaled-up testing for latent TB infection in both high- and low-TB-burden countries. Expanding the treatment options. The WHO is recommending two new shorter treatment regimens to treat latent TB infection. It said that the shorter regimens will help patients adhere to their treatment and complete it. A WHO spokesperson said that only 12 of the 30 countries with a high burden of HIV-associated TB reported the provision of TB-preventive treatment among people living with HIV, and only 13% of the 1.3 million eligible children received preventive treatment in 2016. The spokesperson said that the WHO hopes the new guidelines will disrupt the status quo in many countries and leapfrog global implementation of TB prevention efforts. 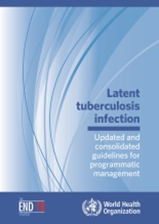 The new guidelines are expected to guide the development of national guidelines for latent TB management, adapted to the national and local epidemiology of TB, the health infrastructure and other national and local determinants. The guidelines will also contribute to global and national responses for finding and reaching those TB patients not in care, through systematic screening and testing. Q: What are the implications for the Global Fund of the new guidelines? Response: The Global Fund welcomes the new TB guidelines. It is hard to estimate the full implications right away. We don’t expect countries to adopt the new guidelines immediately, and they will have to review the new guidelines and include them in their national plans depending on the epidemiological and country context. They will also take into consideration available resources and capacity. Q: Does the Secretariat expect to receive many requests for reprogramming along these lines? Response: Based on past experience, we may see some, but probably not many requests for reprogramming during this allocation period, since it takes time for countries to adopt new guidelines. The uptake and scale-up of currently available preventive therapy for TB among high-risk groups (e.g. children in contact with pulmonary TB patients and eligible people living with HIV) have been slow despite the availability the guidelines and resources. Q: Will the Secretariat be encouraging countries to reprogram? Response: When they are ready to do so. In collaboration with partners, we support countries to implement the new guidelines when adopted by the national programs, based on their epidemiological context, resources and capacity. Q: To what extent will the new guidelines affect demand? In other words, in an ideal world how much more expensive will it be to implement TB programming in recipient countries? Will the Global Fund be producing an estimate of the added cost? Response: It is too early to say. Q: For the last few replenishment campaigns, the Global Fund has produced an estimate of total funding needs for each disease. In December 2015, the Fund estimated that funding needs for TB for 2017–2019 to be $17.7 billion. Presumably, the estimate for 2020–2022 will be higher. Does the Secretariat prepare estimates of the need between replenishment drives? Response: The level of demand which will be created through the new guidelines requires further assessment and analysis together with countries and partners. So, the estimate for the next funding cycle may well be higher. We will take into consideration the guidelines during the preparation of the investment case for the next funding cycle. The hope is that the new guidelines will provide an additional boost in efforts to reduce the TB burden worldwide. They come in the lead-up to what TB advocates hope will be the most important political meeting on the disease to date — the first United Nations high-level meeting on TB, scheduled for 26 September 2018 in New York during the annual meeting of the U.N. General Assembly.